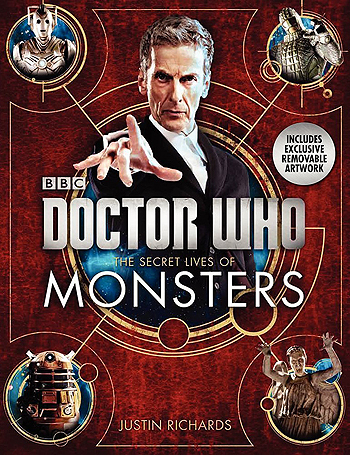 A unique, in-depth look into the hidden lives and mysteries of the monsters from the hit BBC series Doctor Who-a fully illustrated color compendium that reveals proof of the existence of alien life out there and among us, packaged with removable artwork commissioned exclusively for the book. For years, world governments and multinational organizations like the secretive UNIT have suppressed the truth. In this book, leading alientologist Justin Richards finally blows the lid off the biggest conspiracy to radically alter our world since The Scarlioni Incident. Not only is there proof that alien life exists. The aliens are already here. Based on exclusive access to classified UNIT and Torchwood files-shocking information that has been suppressed for centuries-The Secret Lives of Monsters reveals the terrifying truth behind the rumors and legends. Packed with iconic photographs, eyewitness accounts, diagrams and illustrations, and sixteen removable color prints, The Secret Lives of Monsters offers background details on a diverse range of alien species-including planetary and genetic origins, habits, social organization, and first human contact. If you want to know why the Sontaran's probic vent is his weak point or what it is used for; how Daleks reproduce; or how to determine whether your best friend is a Zygon, the answers-as well as everything you need to know to survive future invasions-are here in The Secret Lives of Monsters.